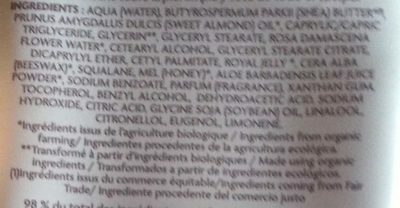 aqua / water, butyrospermum parkii (shea) butter, prunus amygdalluls dulcis (sweet almond oil), caprylic / capric triglyceride, glycerin, glyceryl stearate, rosa damascena flower water, cetearyl alcohol, glyceryl stearate citrate, dicaprylyl ether, cetyl palamitate, royal jelly, cera alra (beeswax), squalane, mel (honey), aloe barbadensis leaf juice powder, sodium benzoate, parfum (fragrance), xanthan gum, tocopherol, benzyl alcohol, dehydroacetic acid, sodium hydroxide, citric acid, glycine soja (soy bean) oil, linalool, citronellol, eugenol, limonene. Product added on December 6, 2018 at 11:05:23 AM CET by openfoodfacts-contributors. Last edit of product page on December 9, 2018 at 12:42:02 PM CET by khorkaadren.